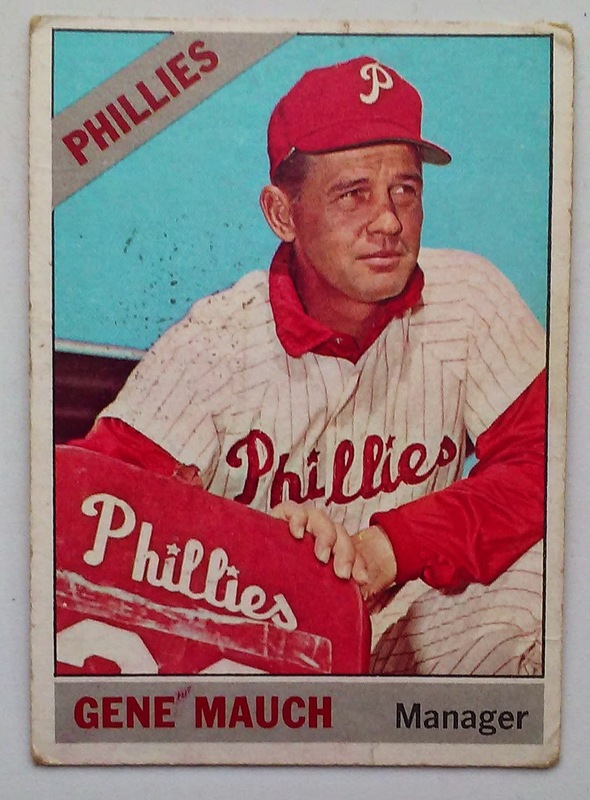 This is our second 1964 Phillies related posting in the last couple of days and we have another manager related card. And like last weeks card today's entry is another Manager card, Pat Corrales was not the leader of the 64 club but he would helm the Phillies in the early 80s. He is also the man who connect the team series that we have run so far - Corrales played for the 1964 Phils and managed the 1983 Phils. Corrales' contributions to the 1964 squad were negligible, He was a rookie who pinch hit in two games. He remained with the Phillie for the 1965 season with whom he played a career high 63 games. The rest of his career was spent bouncing around the fringes for three different clubs, his final Major League game came in 1973. As mentioned above Pat Corrales was a manager of the NL Pennant winning 1983 Phillies. However, he was not THE manager. Despite having the team in first place, Corrales was fired after the All-Star Break, Paul Owens took over and led the team to the playoffs. 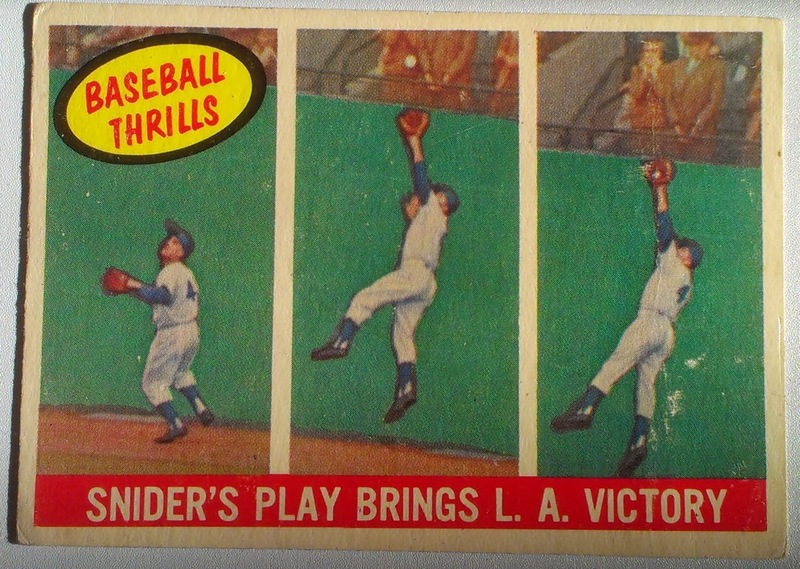 Today we close out our year long look at the 1959 Topps Baseball Thrills Subset. This may be our last column on the subset but it is the first card from the series and it is dedicated to one of the greatest players of the era or any era, Mickey Mantle. While some of the 1959 BT subset cards honor events that date back several seasons, the Mantle reflects directly back to 1958. For the 3rd time in four years Mantle led the AL in Home Runs. 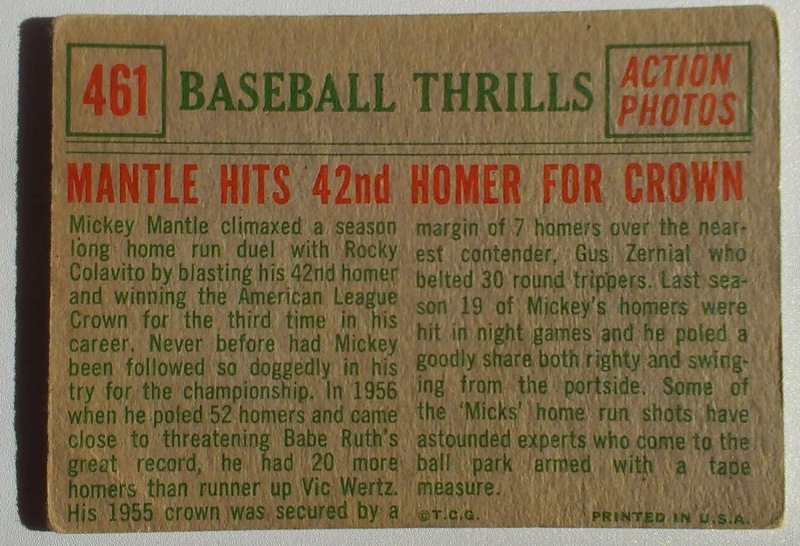 The Card back goes into some detail on Mantles 1950s HR titles. 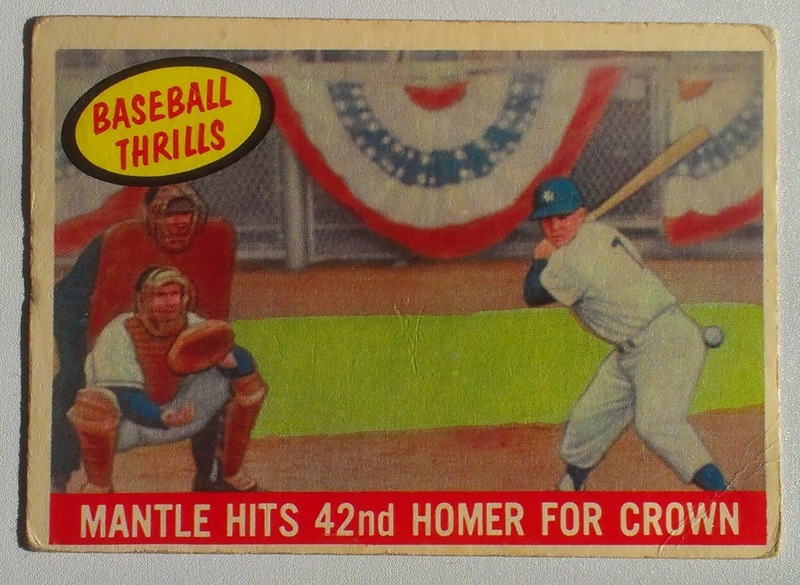 Mantle's 42nd Homer alluded to on the card was hit off of Tom Brewer, a Right-Handed Pitcher. The 1959 Baseball Thrills Card represents a Home Run that Mantle hit off of Tom Brewer, a Right Handed Pitcher. According to baseball-ref, every AB Mantle took versus righties in 1958, was as a Left Handed Batter. Therefore the image depicted here cannot be the AB upon wihch Mantle hit Homer #42. That as far as I took my research before once again checking with the 1959 Topps blog. CommishBob found that the photo the card pix was from the 1958 World Series. I hope you enjoyed our first Subset Series. We have another fun subset scheduedl for 2015, that series will commence soon. 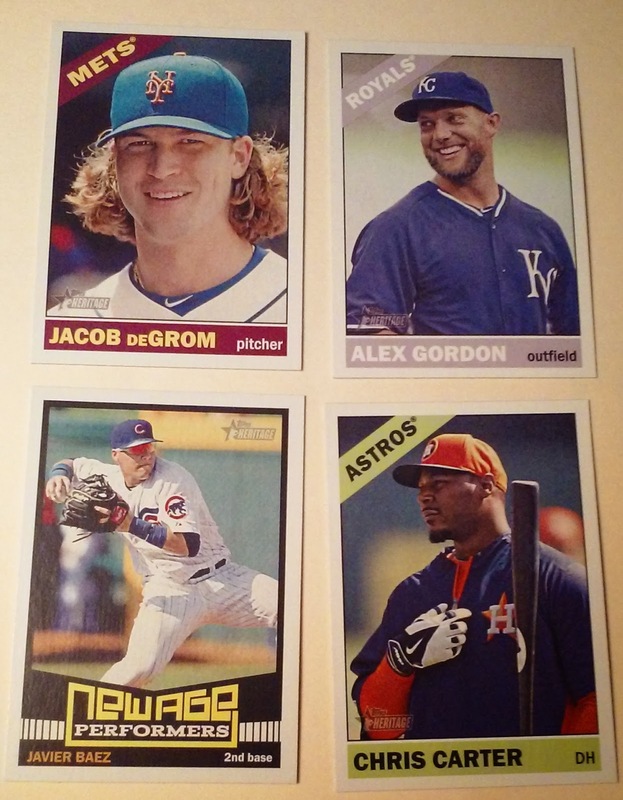 Topps elected to include Mangers in 2015 Heritage. I have mixed opinions on this. Heritage only has 500 cards (425 if you don't count SPs). Not sure how many of those are used for Managers. I did a spot check and not all 30 managers are on the checker - I didn't see Joe Maddon or Mike Methany on the list. The Phillies were led by Gene Mauch from 1960 through 1968. Their peak was 1964 when the Phils won 92 games. Mauch went on to manage the Expos Twins and Angels Winning 102 games. Every Manager that has won more games is in the Hall of Fame. The 1964 Phils are one of three teams that Mauch took to the edge of the World Series. Mauch led two Angels teams in the mid-80s that lost winner take all ALCS games. The 1982 versus the Brewers the Angles took a 2 games to none lead in the then 5 game series. They lost the subsequent 3 games including a 1 run loss in game 5 which they led at the top of the 7th. They then lost game 5 to the Brewers after leading 3-2. Four years later the 1986 Angels faced Boston in a 7 game ALCS. The Angles were set to clinch with a three run 9th inning lead in a crazy game 5, but things didn't work out. Don Baylor and Dave Henderson each hit 2 Run homers for the Red Sox. The Angels tied the game in the bottom of the inning sending it to extras. In the top 11th Henderson hit a sac fly for the game winner. The series returned to Boston and the Angels never recovered - losing games 6 and 7 by scores of 10-4 and 8-1. 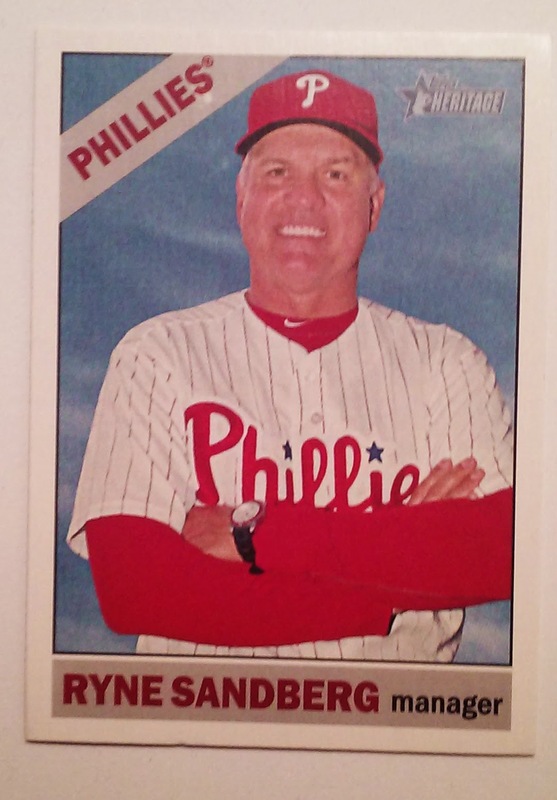 One of the few Phillies cards Topps matched up with the 1966 checker was the Ryne Sandberg manager card. Although they didn't do much to match up the shot. I have always liked the shot of Gene Mauch - not sure if what is in the foreground with the Phillies logo, perhaps a practice jersey stretched over a seat back or a bag. Regardless it is a bit different then your typical manager card of the era. If you look closely, as the Phillies Room Noted, Topps neglected to match up the capitalized font on 'Manager'. There is a big 'M' on the original, while Heritage goes with the little 'm'. The non-capitalized position is the format used throughout the set outside of the manager cards. Ryne Sandberg is about to start his 2nd full season at the helm of the Phillies, No matter how successful he is here, I doubt he gets to manage the squad as long as Mauch's 9 seasons. Times have changed and the Phils just don't appear to have the talent that will get the team turned around soon enough for Sandberg to hold on for a long tenure. We return to our 1959 Topps Baseball Thrills series in the hopes of finishing the set prior to the start of the 2015 season. Today we look at Dodgers Hall of Fame Center Fielder Duke Snider. Duke Snider never won an MVP award but he led the NL in Offensive WAR three times, Position Player WAR twice, and Overall WAR once. He was a member of Dodgers clubs that won World Series in both Brooklyn (1955) and LA (1959). The eight time all-star was an early member of the 400 HR club, but had to wait until his 10th ballot to get into the Hall of Fame (1980). Snider's career WAR numbers are consistent with Hall of Fame Center Fielders. The Hall has inducted 18 players at the position and Snider is top 10 in WAR, WAR7 and JAWS - of course Kenny Lofton is top 12 in those 3 categories and he has been scratched from the ballot. 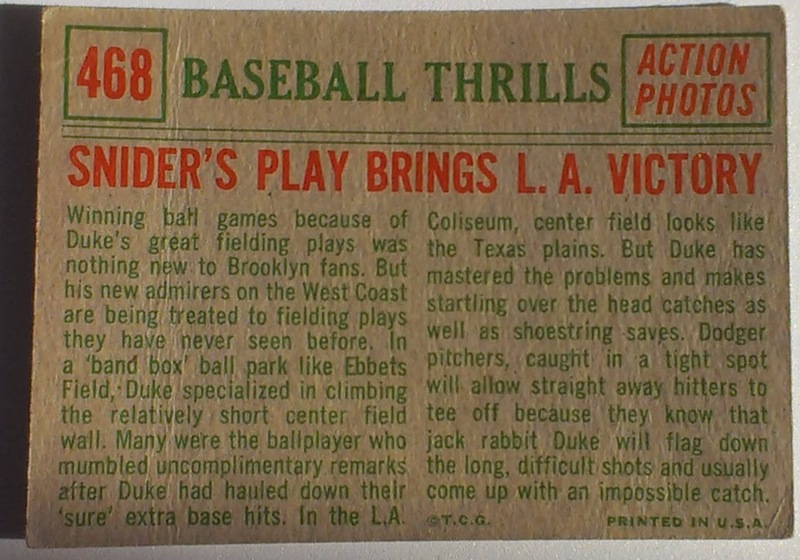 The 1959T Baseball Thrills card that features Snider is one of 3 fielding cards in the set and the reverse of the card documents Snider's defensive prowess. Unfortunately the numbers don't share that opinion. dWAR is even at best for Snider, and was a negative for his career. The conventional stats like putouts showed Snider hovered around 5th place in an 8 team league. Ken Giles had an impressive Rookie Campaign in 2014. He became a valuable set up man, pitching 45+ innings with a very efficient 1.18 ERA (336 ERA+). Giles performance was recognized with a 4th place finish in the Rookie of the Year voting. Regardless of Giles success the Phillies would likley looking at ways to move Jonathan Papelbon, and if that does happen GIles would inherit the Closer role. 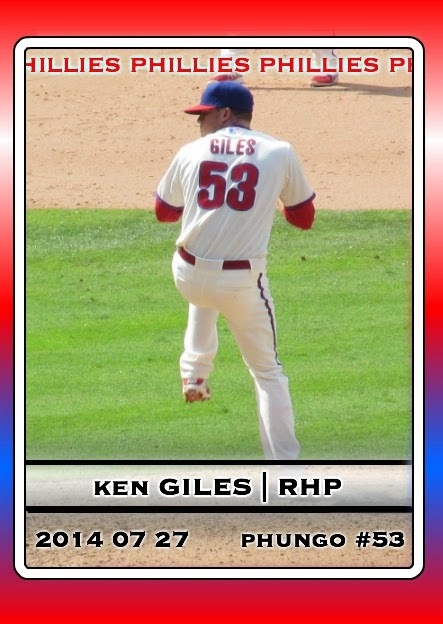 But who is Ken Giles? Prior to 2014 Giles had struggled throwing strikes and had some health issues. His control issues seem to have resurfaced during the early spring (5 Walks in 5 2/3 Innings). During 2014 Giles was good enough for +2.0 WAR, however that was with a 5.8 K/BB rate. He is nowhere near that in his 5 spring training outings so far. This pix is from a Beautiful Sunday Day Game versus the Arizona Diamondbacks. Giles showed all parts of his game, He struck out a batter and gave up a four pitch walk prior to inducing fellow RoY Candidate Ender Incarte to ground into a double play. It was one of only 3 DPs that Incante hit into in 447 PAs. The Phillies picked up Jerome Williams in early August of 2014 and he well. Over the course of nine starts with the club the Right Hander went 4-2 with a 2.83 ERA. During his brief stint with the Phillies Williams peripheral numbers were better than career averages, in most categories including WHIP, H/9, K/9, BB/9 K/BB, ERA+ and FIP. Maybe Jerome WIlliams has found something, however I would think his 9 start bump with the 2014 Phillies is an anomaly. His 132 ERA+ with the Phils far exceeds any number he has ever put up. Outside of his rookie campaign in 2003 (128 ERA+) Williams has never done better than 104 ERA+. It is also worth noting that Williams is now 33 years old and last year was not good enough to stick with not one but two teams that lost more games then the Phillies (Astros and Rangers). Additionally Williams has struggled in two spring starts. I am projecting a regression to mean for Jerome Williams. Last year he posted 1.5 WAR for the Phillies but negative numbers for each of his Texas based teams. At his age he is a replacement palyer at best. 0 WAR. 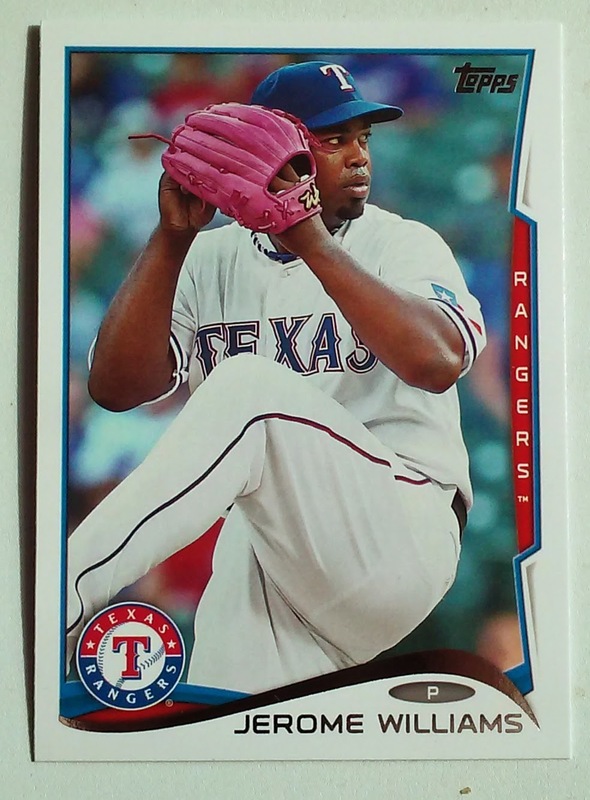 I like this card with a nice photo which prominently features Jerome Williams signature pink glove. Williams wears the distinct glove to honor the memory of his mother who died of Breast Cancer. For over two decades me and a few college buddies have taken part of an annual bit of decadence centered around NCAA March Madness. 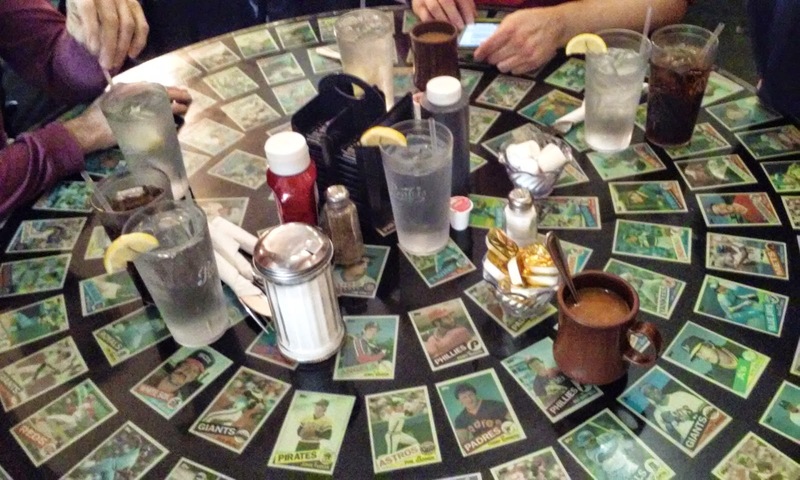 In recent years the host -hood has been Bel Air Maryland, A routine stop on that tour is breakfast at the Ballpark Restaurant. It is a bit of a sports memorabilia museum with a heavy dose of Orioles, Ravens and Colts, but encompassing many other teams and legends. 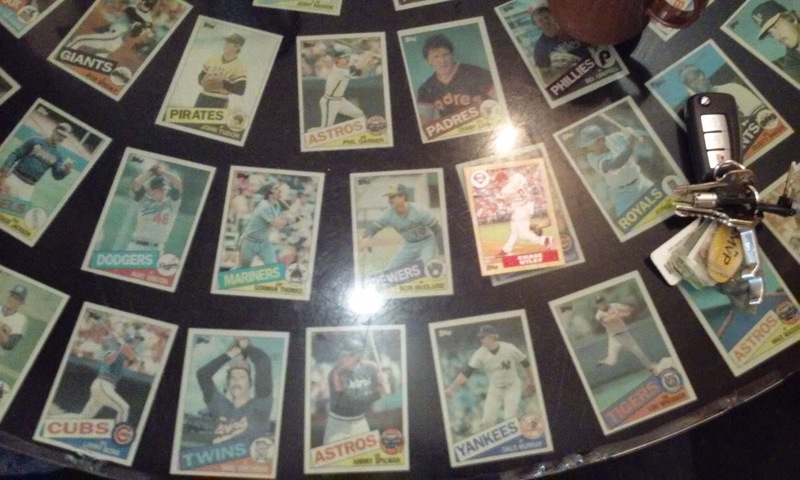 This year we were seated at a table that had the 1985 Topps Set varnished to the top. 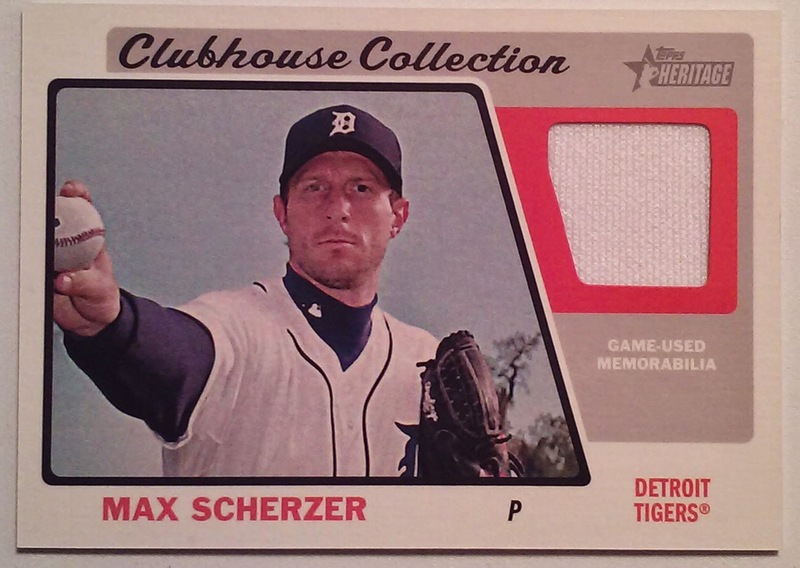 Pretty cool idea for a junk wax era set. It isn't just throw away players, The Bullseye of the table is Mike Schmidt (under the Jelly Rack, you can see the Phillies logo jutting out) Garry Maddox and be seen pretty clearly just below center. I was seated between Reggie Jackson (then w/ the Angels) and Dennis Eckersley (Cubs). In fact the set was so cool that #WalletCard Chase Utley decide to hang out with the rest o the cards. He is seated next to The Phillies current pitching coach Bob McClure. Larry Bowa (Bottom left - Cubs) Burt Hooton, Goman Thomas (Mariners), Lou Whitaker (Bottom Right), John Tudor (Pirates Top) Phil Garner (Astros) can all be spotted. 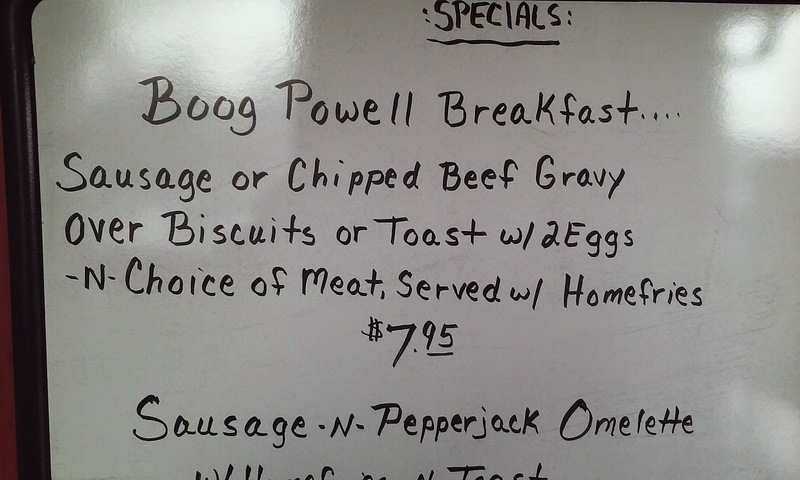 In general the kitsch of the restaurant doesn't extend to the names of the menu selections, however they did have a special noted as the "Boog Powell Breakfast". This was ordered by a member of our party and is a pretty good deal - note that in addition to whichever version of SOS you choose you also get an additional side of breakfast meat. Definitely a meal worthy of it's namesake. The Aftermath. Note I am the one that didn't finish the toast crusts. Boog Powell snubbed his hash browns. 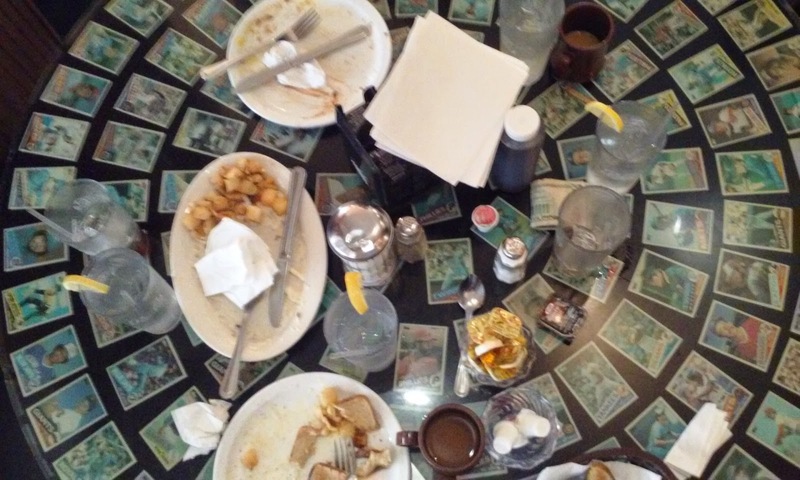 That clean plate belongs to easily the thinnest member of our party. Known as "Concrete Charlie" Chuck Bednarik played both offense and defense - thus a second monicker "Sixty Minute Man". He was a member of the Philadelphia Eagles last championship squad, clear back in 1960. And he was the man who knocked Frank Gifford down so hard he missed a year of football. 2007 UD Masterpieces was one of my favorite sets to release since I returned to the hobby. After the initial success of the baseball set UD came out with Hockey and Football sets in 2008. This fine Chuck Bednarik card featuring the image from the famous Frank Gifford play is just one of many fine examples of the great cards in Masterpieces. Too check into our Hall of Fame profile of Bednarik click here. Rich Hoffman's piece for the Daily News can be found here. When I first started doing the Phillies 2015 WAR projections I had David Buchanan #6 on the Starting Pitcher depth chart and possibly headed to AAA. Well the Injury to Cliff Lee, the questionable status of Aaron Harang, and Buchanan's decent spring has changed this. I now see Buchanan as almost a definite for the Opening Day Roster. 2014T Update is a nice card to have of Buchanan, good photo with the MLB Rookie Card flair. Buchanan made his major league debut on Memorial Day Weekend of last year versus the Dodgers. He pitched 5 innings and picked up the W. For the season he 6-8 and with a 3.75 ERA. He had a decent season for a rookie, putting up numbers typical of your average major league pitcher. His 99 ERA+ number is the most average of these numbers. Buchanan pitched to contact and I think the loss of a steady shortstop may hurt him. I am projecting a slight dropoff from his 2014 campaign when Buchanan posted a 1.4 WAR and going with 1.0 Even for this season. Successfully avoided Target for a week after Heritage's release this year, but finally gave in earlier this week. Overall I was happy with look and feel of the cards. 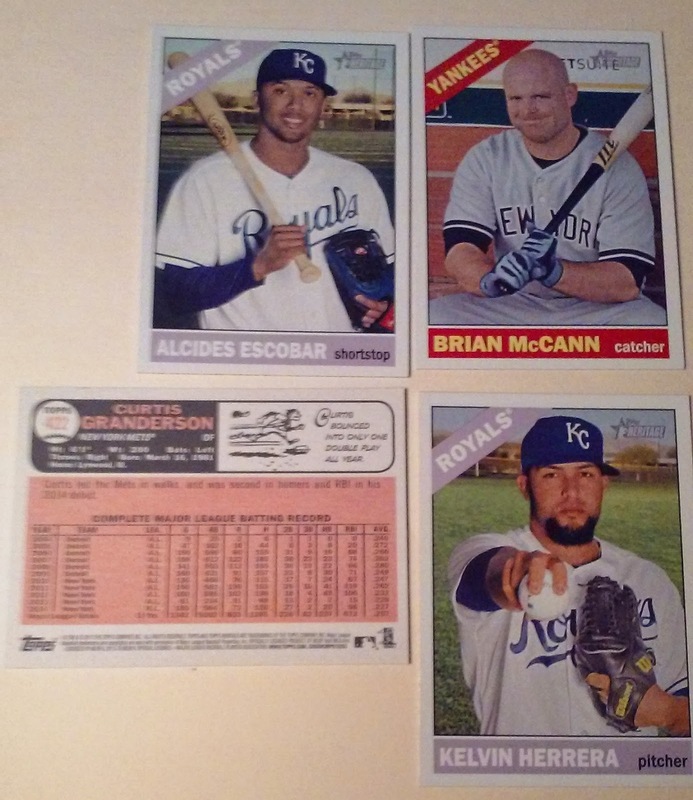 Here are the highlights from 3 purchases - 1 Blaster, 1 Rack, 1 Loose Pack. please excuse the meh photo quality, these are Quick and Dirty shots under low light, Hopefully will revisit Heritage a little more in the upcoming weeks. Pack 1 was a Royals hot pack. Have been a fan of Herrera since seeing him pitch at Wilmington DE a few years back. There are far too many of the rookie stars representing two ball clubs. 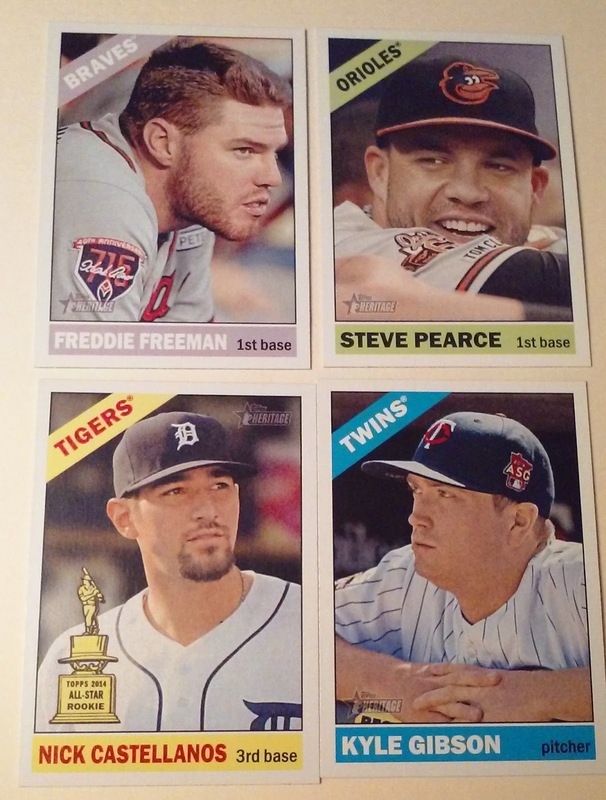 I appreciate Topps trying to carry the banner motif to both sides of the card, but it looks lame. 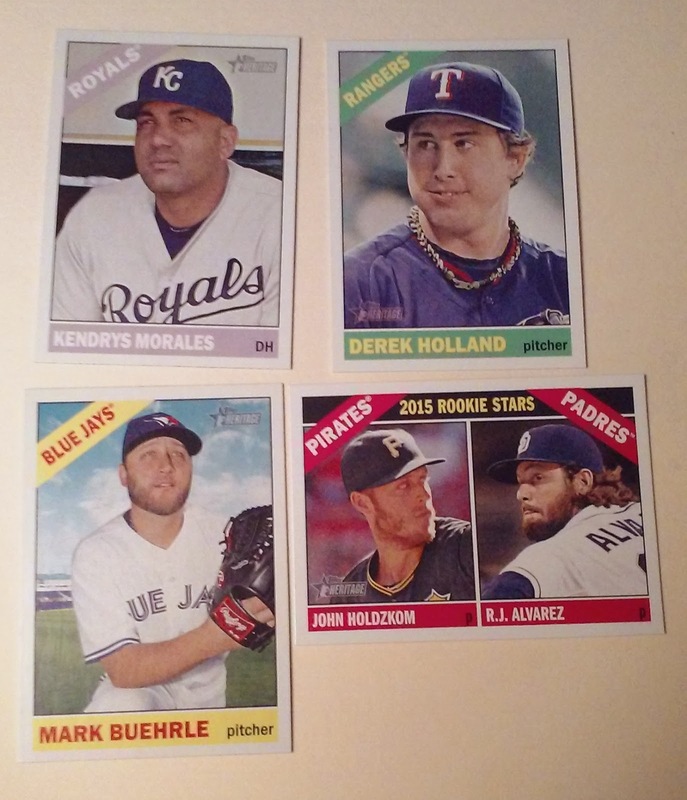 On the other hand, I do like the Mark Buehrle card. Good shot of a deserving veteran. No Phils or hits in the first pack, but did find a few in the remaining pickups. It's a Phil, but not a player - although he was a Hall of Fame player prior to being a manager. 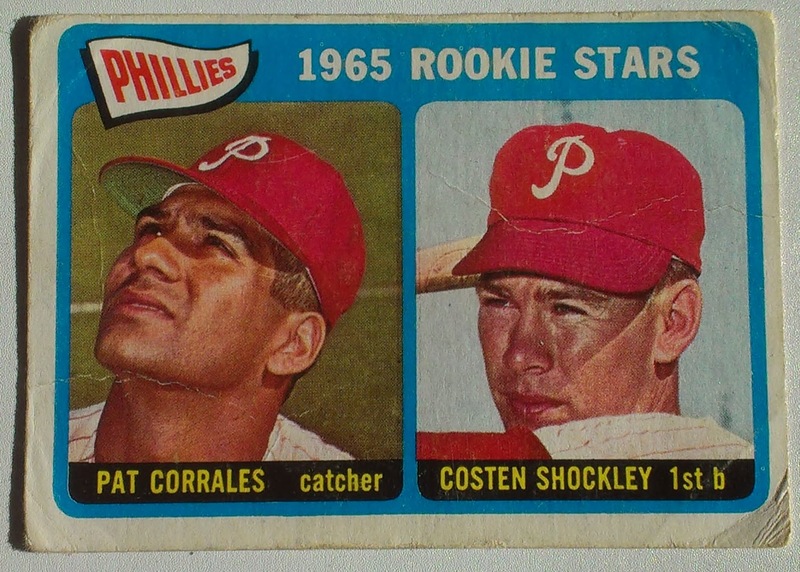 As the Phillies Rooom pointed out, it is a little sad that Topps neglected matching the capitalization on the original 1966T cards. I really like all the special patches that are on MLB unis these days. Here we have Freddie Freeman with Hank Aaron 715 HR anniversary swag. Steve Pearce has a patch honoring the memory of Orioles minority owner and author Tom Clancy. Kyle Gibson has the ASG patch mentioned at the top of this post. No patch for Nick Casteallanos but I wanted to post a Rookie Cup card, which reminds me - Are there any RC logos in 2015 Heritage. I didn't recall seeing any in the lot I picked up. Three Hi numbers and an NAP. There are 75 Hi SPs in Heritage, kind of curious if there is a disproportionate number of stars in the range. Future post possibility. The top card notes the date the Experience was formed by Jimi Hendrix, Noel Redding, and Mitch Mitchell , October 12 1966. The Al Kaline card refers to a game a few weeks earlier on September 28th. Kaline hit a pair of Homers including a 10th inning shot which was the difference. The card does not mention that Kaline also had a stolen base and outfield assist in the game. Not a fan of this card, also saving that up for a future post. This card is dedicated to Ryan's second no-hitter, July 15 1973. There are 15 cards in the Target Only set, this is the first where Ryan reps the Angels. I think the Topps Heritage Chrome inserts come 1 in 23 packs. So yeah the hit of the box and the Chrome card are both cards of players that have changed teams. bleck. As I mentioned above, I am happy with this years set. This may be due to low expectations. 1966 is one of the blander Topps releases. But I think Topps has done a good job of mixing in some semi-action shots and featuring more than the standard headshots of the original sets. Solid photography has caught some players in interesting moments and as I have noted, I like seeing several cards with interesting patches and uniform flair. Referring to Larry Greene as a first rounder is a bit of a misnomer, He was a 1st round supplemental picked 39th overall. Part of a first round that featured 60 picks total - basically two full rounds. The pick was a compensation pick for the Free Agent loss of Jayson Werth. As we know being a first round pick doesn't make you baseball player. This appears to be the case for Larry Greene who elected to not report to Spring Training this year. Baseball America's First Ranking of Larry Greene as a Phils Prospect came in 2012. He was ranked 20th among the players in the club's system. He progressed to #11 in 2013 before falling out of the top 30 last year. In early reports BA comped Greene to short time Phils bench bat Russell Branyan. Larry Greene is only 22, so he is young enough to return to baseball. He also likely has other athletic options outside of baseball. The Phillies lured Greene away from Alabama where he had the opportunity to play College Football. In 2014 MLB held the 50th edition of the draft. Out of the fifty #39 picks 22 have made it to the majors - 2 possibly 3 recent draftees will likely be added to that list meaning the #39 pick has a 50/50 shot of making the majors. Among all #39 picks there are 15 players with positive Career WAR numbers. Among that 15 are Current Phillies starting pitcher Jerome Williams and Recent Phil Tony Gwynn Jr. Team Phungo's return to Spring Training for the first time in roughly a decade was one damp and dreary day. Despite a forecast that stated 72 degrees and Sunny, It was a very grey day. There were several showers that passed through and we watched the temperature drop into the lower 60s. Regardless we made the most of the afternoon and came home with these random observations. Cole Hamels put together a solid two innings giving up a lone single and picking up a pair of strikeouts. The Phillies offense hasn't changed, They managed just 4 hits versus Yankees pitching. Ryan Howard was 0-2 and went down on a called strikeout in his first AB. The Phillies sole run came on a Homer by Non-Roster Invitee Xavier Paul. Rule 5 pickup Odubel Herrera looked decent enough and I think he could warrant a spot with the team. I was less encouraged by other players including Jeff Francouer, minor leaguers Mike Nesseth and Cord Phelps. Didi Gregorious has the uneventful of replacing Derek Jeter. The Yankees have given Gregorious the #18 which was worn by Hiroki Kuroda last year. Aaron Judge was the highest rated Yankees prospect (#2) in the game. It is easy to see why the Yankees get excited by the 22 year old outfielder. He is one big man - above he is pictured next to Ryan Howard. Judge picked up a single and worked a walk. He was also picked off in the game - just after the above photo was taken. Strange confluence of events led to this post. Last night I was bindering some cards, one of which was this Dale Murphy card. 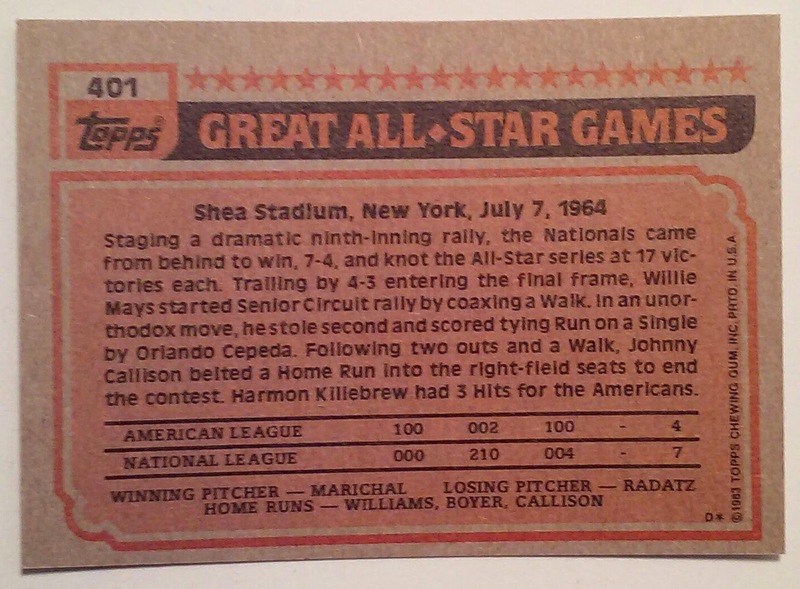 There is a lot of copy here - The 1964 All Star Game will always be the Johnny Callison Game to me. 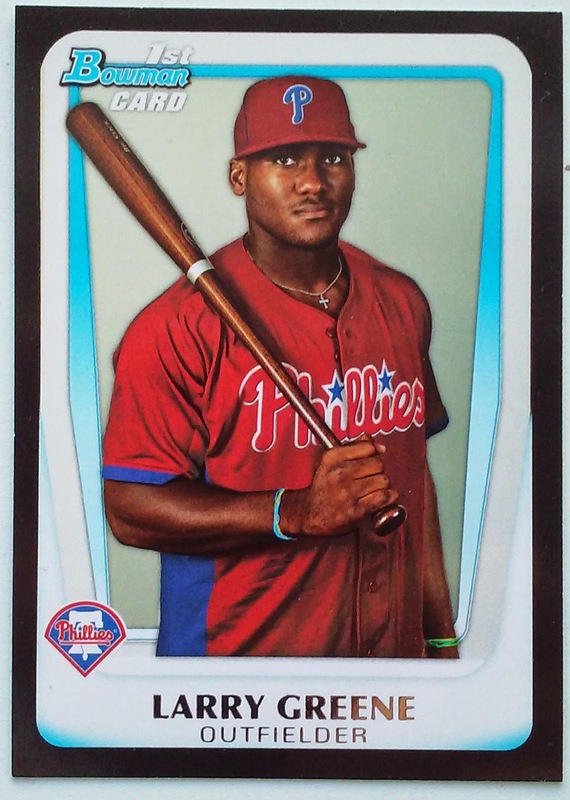 Topps does finally get around to mentioning the Phillies Outfielder in the third sentence. 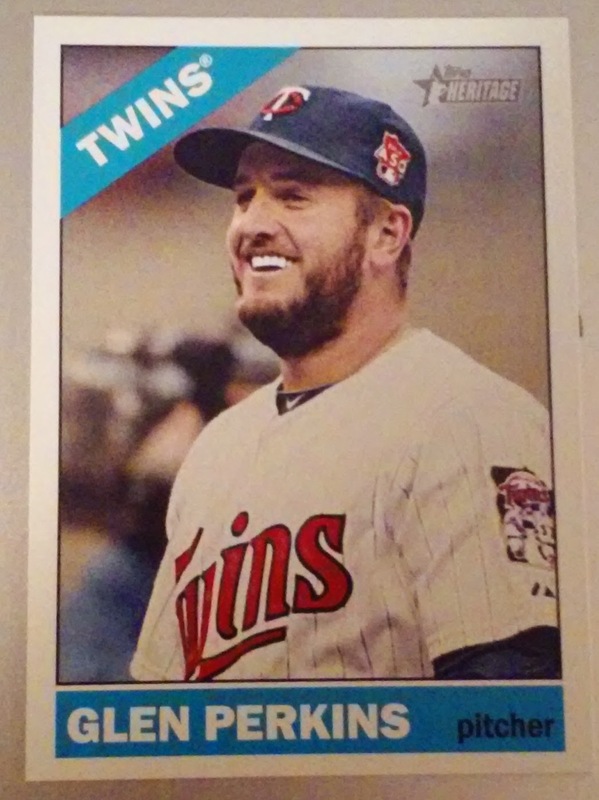 Regardless I am happy to see the game noted in the 1983T All-Star set. This morning @MallonDan noted via twtter that Johnny Callison was born on this date in 1939 and mentioned the 1964 All-Star game. 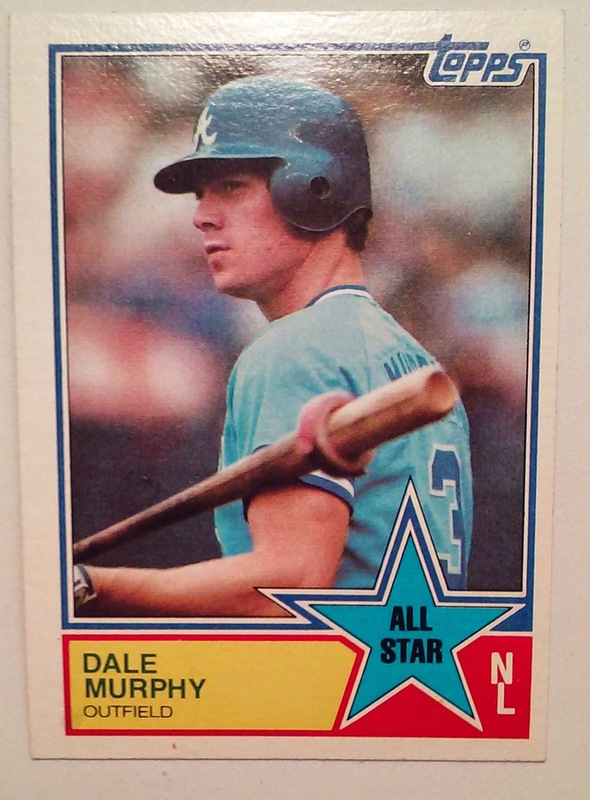 I noted this and thought, "I just read about that game on a Baseball Card last night"
Later in the day Andy at @HighHeatStats mentioned it that the all-time leader for Home Runs among players born on March 12 was Dale Murphy. That's when I thought Hey I was just looking at the card that connects both of these players that share a birth date. 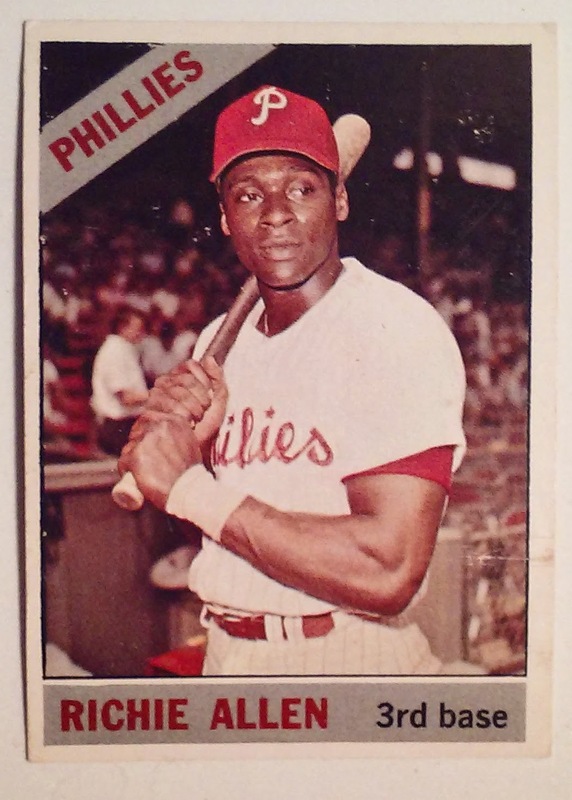 I am adding this post to our 1964 Phillies series. As part of a fundraiser to fight Cancer, Actor Comedian and Phungo Favorite Will Ferrell will be making a special Spring Training tour on Thursday. He will be playing in 5 Cactus League games. One of Ferrell's goal is to play for all 10 teams playing in those five games. He will also attempt to play all 9 positions - a feat first accomplished in a Major League Game 50 years ago by Bert Campaneris. 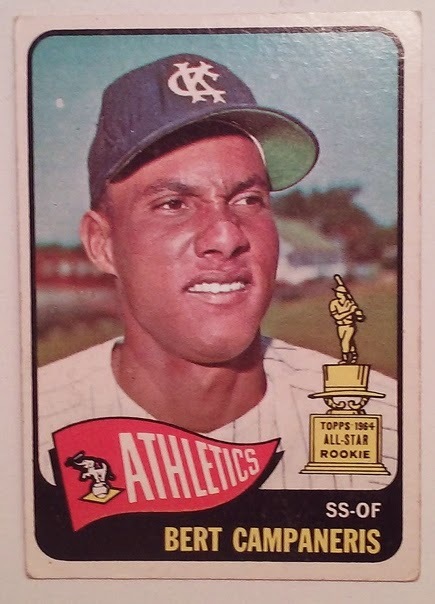 On September 8th 1965 Campy started at shortstop for the Kansas City A's who were hosting the California Angels. He then went on to play all 9 positions including pitcher and catcher. As a batter he went 0-3 but did score a run off a walk. Campaneris pitched the top of the 8th inning giving up a single run off one hit and a couple of walks. He did Strike Out Bobby Knoop. 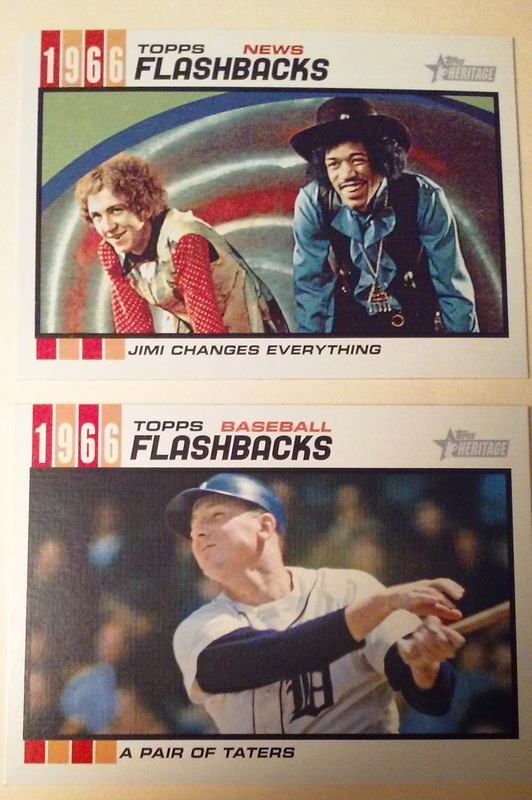 We have slowly been putting together a series of posts looking at different aspects of 1966 Topps/2015 Heritage. 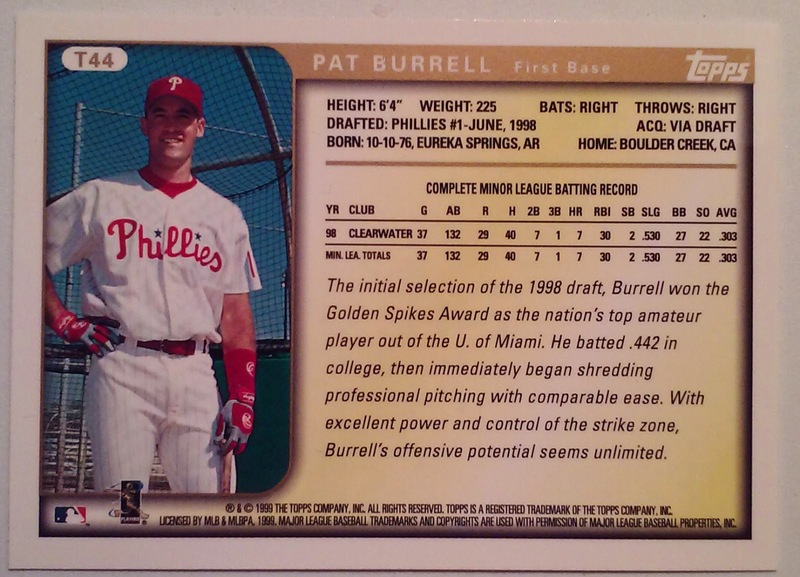 I was pulling for Fred Luderus to get the Phillies Wall Treatment but have no problem with Burrell. He may have never been an All-Star but he had several very good years in Philadelphia. His biggest hit came in Game 5 of the 2008 World Series - A 7th inning double that would eventually score as the series deciding run. 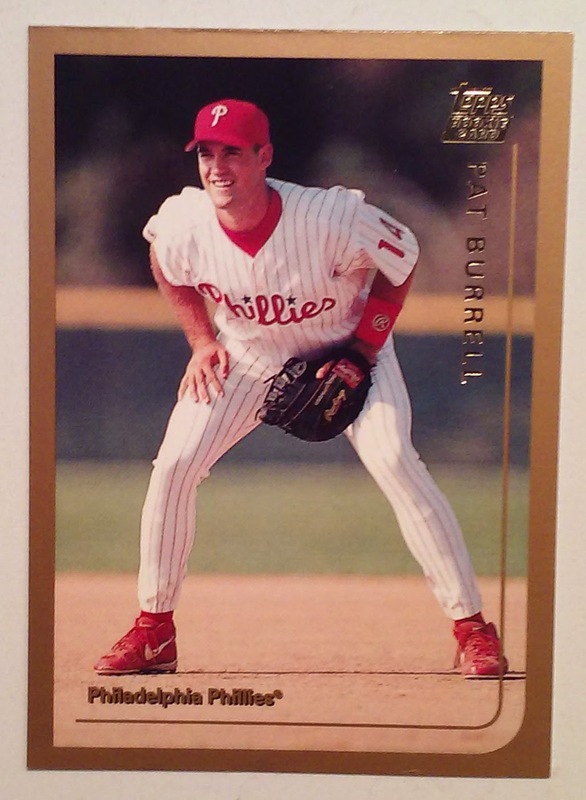 Pat Burrell initially came to the majors as a first baseman which is reflected on a couple of his early cards. 1999T doesn't have the position listed on the front, but if you look at the flip it is listed across the top next to the player name. 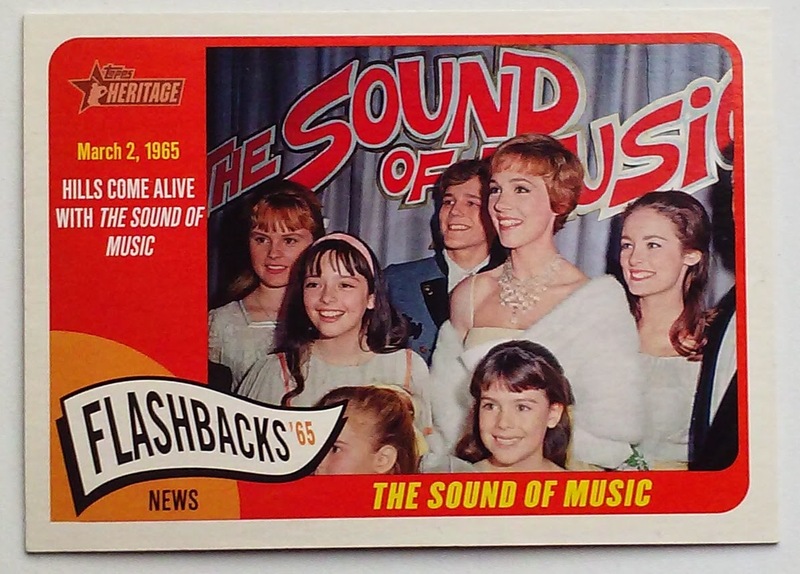 Happy Anniversary "The Sound of Music"
50 Years ago this week the film "The Sound of Music" was released. Last year Topps commemorated the event as part of the Heritage Flashback Subset. 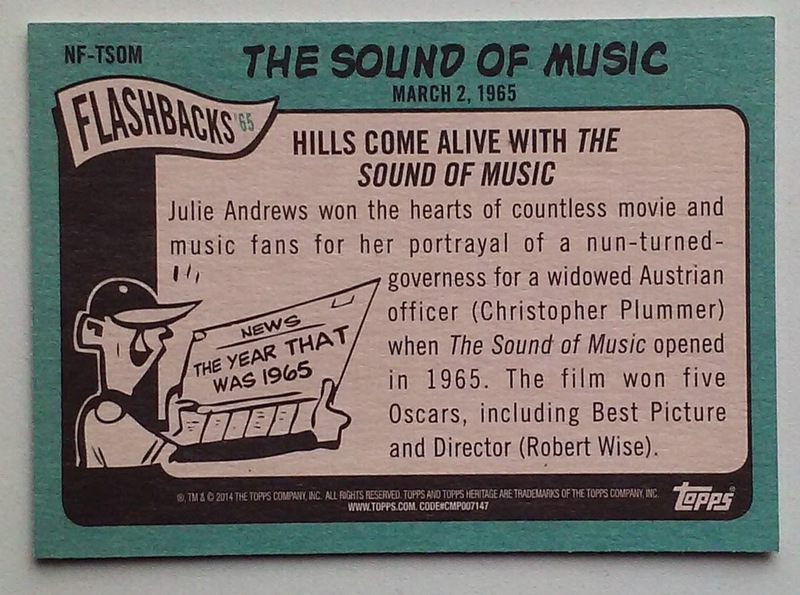 The flips side of the card discusses Jule Andrews, Christopher Plummer and discusses the Awards bestowed upon the film. Much more than I want to get into here, but I will just mention that this film and musical was a large part of the entertainment world in the team Phungo household when I was a kid.